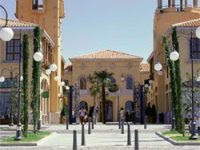 La Roca Village is one of Spain’s best known “outlet” malls. It combines an attractive exterior space where the whole family can have a leisurely walk with the constant temptation of permanent discounts. La Roca Village features more than 100 exclusive boutiques including such prestigious marks as Calvin Klein, Hugo Boss, Versace, Diesel, Camper, Cacharel, Desigual, Custo, and many others. Besides you will find various restaurants and cafeterias for a little relaxing pause between shopping splurges.